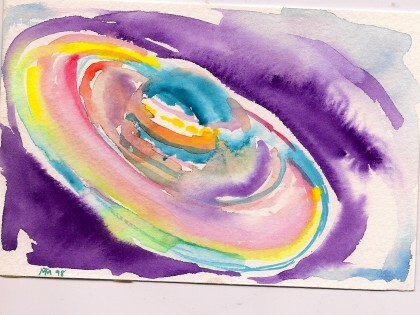 This little watercolor of Saturn I did years ago while using up extra paint reminds me all things that spin must eventually come to a halt. I got a sudden unceremonious object lesson in this phenomenon a few days ago. I was “spinning’ with holiday cake-baking and blog-posting, card-proofing, cat-drawing, phone calls and other exciting stuff when all of a sudden, just as I was about to sit down to a big bowl of lunch, I found myself tripping over my own feet. In a matter of seconds I ricocheted off a chair, the edge of the kitchen counter, the doorway into the dining room, the chimney cupboard right next to it and on down to the bamboo planks of the dining room floor. I broke the fall with the base of my left hand on the pinkie side. Not pretty, but as you can see not as bad as it could be. I also banged up my right shin pretty well. And I was pretty shocked and winded. As I yelled my surprise and dismay loudly and repeatedly, Romeo went into his crate, not sure why I was suddenly making so much noise. “Some Service Dog you are,” I said to him as he eyed me through the mesh, my eyes now level with his. And then I laughed. But just a little. I didn’t have time to laugh. In a lifetime full of falls, I know I have to get busy right away to minimize the collateral damage. Could I get up? Yes, definitely. Didn’t have to crawl or drag myself. First blessing. So up I got, and on into the kitchen to the freezer for the bag of frozen corn. Then on into the medicine cabinet in the bathroom for the Rescue Remedy and the homeopathic arnica. And hot water and bactine for the cut on my palm. I know the drill, and I know it helps if I do it all as quickly as possible. I added a few more things–a little lemon balm tincture, a little comfrey essence tincture. 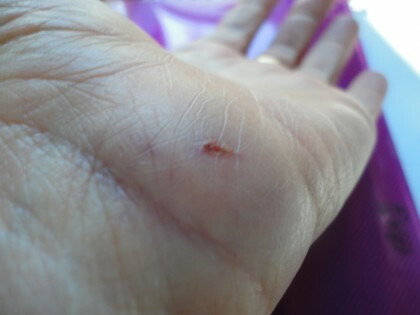 The first thing I thought, though, as I lay on the floor surveying the damage in my left hand was “Oh no, will I be able to do my sun salutations tomorrow morning?” I can be a driven woman. Once I had some arnica and got the cut cleaned up, I ate my veggie “soup” bowl, sometimes with my right hand, which is the CP hand. And found I could type a little. All good news. Then I divided up the corn into two pouches, one for the knee and one for the hand, and bedded down on the couch with Romeo for my nap. Once he saw I was actually going to lay down, he literally pinned me to the couch with his paws, as if making sure I would stay put for a while. Beyond these actual injuries, the thing I was most worried about was the fibromyalgia flare that might result in the next 24 hours, or even the next several minutes. The kind where my whole body reverberates with the pain of the injuries. I call it my barroom brawl effect. It’s like I have been in a fight in an old western saloon. Someone has broken a chair over me and I’ve gone crashing through the hinged wooden saloon doors, landing hard in the dusty street. Even the connective tissue between my toes has throbbed with pain at times like this. So I waited. And worried a little. And wondered. Would the two pieces of my sweet potato spice cake I’d eaten in the last week push me over the “falls” again? But I kept waiting. And waiting. Nothing. By late afternoon I was still a bit dazed but perfectly able to get up and take a walk with Romeo. I felt sore at the sites of impact, just like any “normal” person who fell would. But that was pretty much it. I could even do some yoga in the evening, though I avoided the poses that would require me to bear weight on my outspread palms. I kept taking my arnica for the first 24 hours, and for good measure took a bath in “tea” made from comfrey leaves, and put a poultice of those on my shin, which was pretty sore. By morning, instead of the “barroom brawl” effect from an old western, I was pretty much fine, and just had to be careful not to put too much weight on the hand while it continued to heal, or bump the sore spot on my shin. I can’t say how absolutely amazing this is. It’s almost worth the fall to find out that I am only dealing with the direct effects of it, and nothing else thrown in. 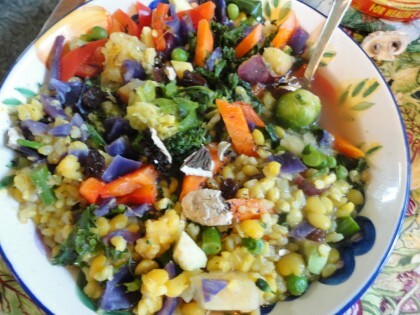 Somewhere along the way of eating the consistent menu of soup, steamed veggies and grains and salads that is my daily eating regimen (and which Dr. Fuhrman recommends for fibromyalgia), my body must have decided it could differentiate pain more carefully again. I am too proud for words of it for having made this decision. And proud of myself for learning how to feed it so, in time, or at least this time, it could. And did. I’ve lived a life full of falls. Because of the CP I was born with, I’ve never had great balance. But it was always essential to my social survival to be someone who “at least tries.” So try I did. Over and over, banging and bumping myself along the way. I scraped knees and hands learning to ride a bike. I broke fingers playing softball. I broke my toe falling out the kitchen door into the garage. I learned to roller skate at the roller rink by not being afraid to fall or crash myself into the wooden boundary around the rink if that was the only way I could stop. At the 7th grade class skating party I ripped my new paisley bell bottoms seam to seam across my behind. I laughed, put on a coat, and kept on skating. In 8th grade, along with things like friendliest, smartest, and best personality, I was also voted “most accident prone.” I wore the distinction like a badge. In adulthood I fell less for a while. Mostly I just bumped into things, which is kind of like falling without hitting the ground. When the MS surfaced, it compounded the problem. And there were just the sudden circumstantial doozies, too. About 14 years ago I was taking therapeutic horseback riding lessons, which I loved. As I put my foot in the stirrup something spooked the horse, and I got dragged down the steps of the mounting platform before the teacher and assistants could get secure hold of the horse. I ended up with a shiner and a big bruise on my shin, but I learned the first aid genius of frozen corn or peas. And a lovely herbalist nurse friend came over that very evening to bandage me up in comfrey for the night. But it was another bad fall four years ago that finally convinced me to finally ask my doctor to test me for fibromyalgia. On a hot summer night I had been feeling a bit dizzy, but decided to go ahead with a litle yoga before bed. I had an episode of vasovegal syncope, and blacked out as I came up from a forward bend, falling and hitting the corner of the masonry stove. I had a very serious “barroom brawl effect” that lasted weeks and could no longer be ignored. It was like a tidal wave of recognition washing over me when I read that fibromyalgia can sometimes be brought on by a bad fall, or a fall in a series of falls that simply puts the reaction to pain over the edge. But evidently my body has climbed back up over that edge. The “barroom brawl effect” has stayed in the old western movies and TV shows, where it belongs. So I’m celebrating, toasting the long haul and the slow miracle by raising my spoonfuls of “everything soup” to this most fortunate of all my falls. Care to join me? It’s leftover Bright Yellow Split Pea and Rice Pilaf and leftover baked Japanese sweet potato steamed with an assortment of fresh and frozen veggies. Some of the steam water, flavored with garlic and onion granules, is ladled over the whole thing. And for good measure a slice of avocado and a few dried mushroom slices crumbled over the top–the “champagne” that fuels this great good fortune. Bottoms up!! so glad you didn’t break anything! This. And yet doctors and people still don’t believe the link between diet and health! Congratulations on experiencing just a normal fall, no more. Well, not congrats, I guess, ’cause falls aren’t really that good, but more so the no additional stuff. 🙂 I’m glad you’re OK, and have climbed back up over that ridge. I vote you “most resilient,” too! Enjoy the everything soup, I may just make a bowl myself. Oh – and I love the picture of Saturn!! So vibrant with colors and swirls. And so glad you love the picture of Saturn! It’s one of my favorites. Wow, great! It’s kind of funny a fall would bring on such good news. It’s crazy and completely disheartening how pain can take over one’s entire body and entire life. Congratulations on your improvements. This is just so cool. The benefits just keep on coming!!! I agree with Veronica! -You get my “most resilient” vote! And I never got why doctors say things like “there is no link between diet and health” when there so obviously is, either. So sorry to hear about the fall Maria but sooo happy to hear that you didn’t get a fibro flare. Absolutely wonderful and amazing !!! I have to convince my daughter of the merits of this way of eating…I see her fall too often and the flareups afterwards are just devastating..
Aw, Angela, thanks for your kind words and enthusiasm!! It’s pretty darn “wonderful,” isn’t it? 🙂 All loving best to you and your daughter for her journey as well. Welcome, Barbara, and thank you so much for this lovely, gentle comment–I am so glad to have you along as you head in the same direction. Your lovely words about “Listening to the Earth” made my evening. All the brightest best to you on your healing journey.